As the Boy Scouts say: “Be Prepared.” And never was a truer word spoken than on moving day. You need to be well organised for a smooth, effortless transition to your new home. Otherwise it’s going to be a very, very, very long day. To avoid unnecessary stress, start a moving house checklist well in advance of your move, bearing in mind that there are lots of little things to remember that will need to be ticked off your list. Your moving journey starts with 3 basic but critical logistical steps, which can be broken down into: Arranging your physical move, making plans for your kids and pets and notifying people and organisations of your change of address. Book your removalist as soon as you know when you can move into your new home. It seems obvious, but once you’ve got a date pinned down, it is far easier to work towards a deadline. Sort out your insurance. Most removal companies don’t provide full insurance for your move as they have to be licensed brokers to do so. Removal companies will provide transit insurance, which covers any damage to your furniture if their truck is involved in an accident or rolls while they are transporting your goods. You’ll need to check whether your house and contents insurance covers your furniture and belongings, or whether you need to extend your cover to include your move. Your children and fur family are also impacted by the stress and disruption of a move. It might be worth your while to make arrangements for them on the day of the move. Arrange a playdate for your kids with a friend, or ask granny and granddad to take them for the day. It will keep them from getting under your feet, and everyone will be happier all round. The same goes for your pets. It’s better for your dogs and cats to be out of the house on moving day. There will be a lot of people walking in and out and they may become anxious and get out of your property. Find someone to dog- or cat-sit them for the day. Start preparing your pets in advance for the big move. If you’ve got a bit of a drive ahead of you to your new house, make sure you’ve got the right travelling containers for them. Animals are prone to travel sickness, so if your animals are not used to going in the car, take them for a few drives around the neighbourhood before your move. Moving house means a new address. Make sure you inform everyone who needs to know. Send out a change of address card or email to all your friends and family, giving them your new address and contact details. Get your utilities moved over to the new house, as well as your online services and networks. Inform banks, insurance companies, schools and any other institutions that correspond with you. This can be the most daunting task of the whole exercise. But plan it properly and you’ll do fine. The most common reason for a removal running over time is because the customer isn’t ready when the removal guys arrive. You should aim to have your packing finished the night before your move. Boxes – get strong, well-structured boxes from your removalist. Supermarket boxes are often flimsy and will break and damage your goods. Dangerous goods (Gas, Petrol, Flammables) Removalists are not allowed to transport them, so drain the fuel out of your lawnmower, make sure gas cylinders are empty, and tighten the lids on all containers holding liquid. Use the right size boxes and don’t overload them, otherwise your boxes will be too heavy for the removalists to pick up. Heavy items such as books should be packed into smaller boxes. Glassware, crockery and other breakables should be well wrapped in packing paper or bubble wrap and packed snugly into boxes so they don’t move around. Painting and art work, these should be wrapped in paper backed bubble wrap for extra protection. Don’t forget to state if the artwork is framed and which side the glass is on. It is also advisable to write in big letters on the packaging “This side up” and/or “Super Fragile”, when wrapping the items for moving. The removalists won’t have an issue with you also pointing this out on the day so that extra care is taken. Mark your boxes. Don’t forget to write the room name on tape stuck on the top of your sealed moving boxes This will speed things along as the removalists won’t have to ask you every 5 minutes where they go when you arrive at your new home. Pack a survival kit. Pack a box with bedding, the kettle, a few items of crockery and cutlery and some basic ingredients for a quick meal to take with you in the car. You don’t want to rummage through boxes on your first night to find the basics. When you get to your new house, there are a few clever ideas to make the whole exercise easier. Have a floor plan. This way the removalist team will know to put the boxes in a place away from where your furniture is going. This will avoid the unproductive task of double handling (moving boxes twice). If space allows, your removal team can bundle your boxes into one area. Then when the larger items of furniture are in position they can distribute the boxes to the relevant rooms. Protect your floors. If you’ve had new floors laid prior to moving house, ask the moving team to lay down blankets to protect them from scuffing and other marks. They’ll be more than happy to do it. Let your removalists know in advance. If you have a sofa, mattress or other large item that won’t fit through your door which will require lowering over a balcony or to be walked down the stairwell, so they can come prepared. You may have a precious family heirloom, or a treasured memento that needs special handling. Let your moving company know beforehand of any unusual items that require extra care. 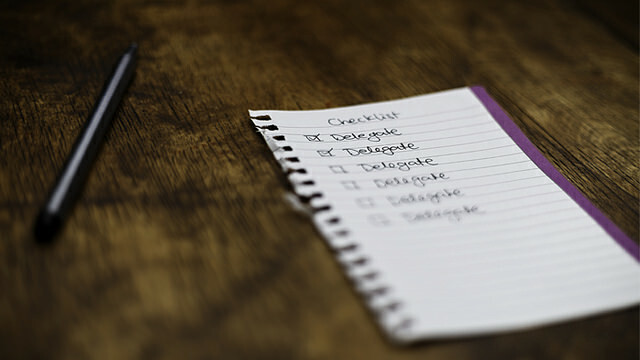 In conclusion, by creating a checklist of all the things you need to do when you move to your new home is vital. Communicating with your removalists before and during your move, ensuring you have all the right equipment to pack properly and packing well in advance will save a lot of time and headaches. While getting utilities switched on or notifying people of your new address are all things that can easily slip your mind.